Hi everyone! A bit about the academic features this time! Did you know more than 80% of the lecture theatres at Surrey have lecture capture? 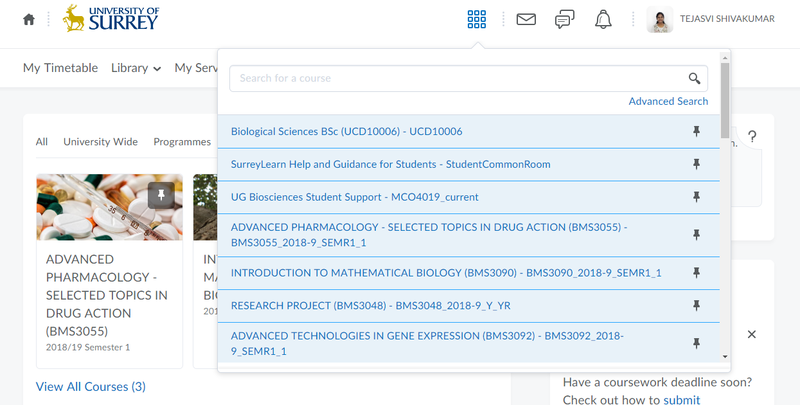 Lecture capture is an automated lecture recording system, and the students can access these lectures in their Virtual Learning Environment (VLE) for future reference. I personally love this feature because it is impossible to take note of everything the lecturer is saying and lecture capture makes it possible to refer back (especially while preparing for exams!). This is the student’s go-to-place for anything academic! You can access all your modules, submissions and grades. Moreover, you can check your work with Turnitin, a software that detects plagiarism. My coursework submissions are on Tuesdays at 4, mostly online, uploaded on Surreylearn. It is difficult to juggle more than one coursework submission on the same day. But you do learn some organisational and time management skills while you’re at it! What I am really trying to say is that they’re really helpful if you have any questions about coursework, which is super-awesome. Timetabling – A lot of students ask me how this will look like! Timetables are pretty varied day-to-day. For instance, there are days when I’ve had full day of lectures but others when I’ve had none. Some days I have 2/3 hour lectures scattered from 9-6. It’s always 9-6 and just on Wednesdays all lectures have to finish by 12. These free Wednesday afternoons are used by students to play sports, learn a new language and other extracurricular activities. It’s a little different in some master’s courses, you may have intensive weeks and very different for PhDs, where you and your supervisor decide how/when to work. Most books in the recommend and essential reading list of the modules are available in the library to borrow. There are also lots of study spaces in the library: Individual, silent and group study spaces. If I have free time in between lectures, I head to the library to quickly revise. It is centrally located, so it helps with lectures being in different locations on campus.